With the new proposed rule changes, Major League Baseball is effectively eliminating left-handed relievers. As a result, we are not going to see situations where Josh Edgin comes into a pressure situation to strike out Bryce Harper to get the improbable save. Now, you can’t risk that because you can’t let Edgin face the next two batters. Seeing this rule change the Mets are going to have to look more at left-handed relievers like Justin Wilson and less of the ilk of Luis Avilan. Before this baseball alerting rule goes into effect in the 2020 season, it seems like a good time to take a look at who the best left-handed relievers are in Mets history. Can you name them? Good luck! Nori Aoki – He looked so much better in September than he did in all of 2017 by being competent while playing on a dysfunctional team. Jerry Blevins – Throughout all the stress of the season and his extreme workload, the man didn’t even put on one pound. Chasen Bradford – With his call-up to the majors, he’s now on the short list for best beards in Mets history. Jay Bruce – He learned from his experience last year, and he played well for a team that acquired him in a trade. Asdrubal Cabrera – As we found out this season, all he wanted the Mets to do was to pick up his option so he could provide for him family. With the Mets having done that, he can now rest easy. Jamie Callahan – One day when bards tell the tale of the six right-handed relievers the Mets acquired at the 2017 deadline, they will regale us all with stories of how Callahan was the first of them to finish out a game the Mets won. Gavin Cecchini – He made the switch from short to second where it will be easier for him to make it to the majors. That goes double if the Mets who are tightening payroll off a poor season don’t bring in a free agent to play the position. Yoenis Cespedes – With Cespedes missing half the season, that left a lot of time for him to hit the course. Michael Conforto – Collins is gone meaning no one is standing in his way from being a superstar anymore. Travis d’Arnaud – He became the greatest defensive second baseman in Mets history by posting a 1.000 fielding percentage at the position. Jacob deGrom – With him pitching so well this year, he knows he will finally be able to cash in in arbitration thereby allowing him to afford a haircut. Lucas Duda – The slugger was the first Mets player traded at the deadline, and he temporarily got to avoid the We Follow Lucas Duda filming. Josh Edgin – He could be the only pitcher in the history of the Mets organization who is capable of getting both Bryce Harper and Daniel Murphy out. Phillip Evans – After winning a batting title in 2016, having a good Spring Training, and a good second half for Vegas, the Mets finally decided to let him post similarly good numbers for them in September. Jeurys Familia – Blood clots in his shoulder costing him most of the season made most people forget why he missed the beginning of the season. Chris Flexen – As we learned with Mike Pelfrey, being a Mets pitcher who struggled in the majors after completely skipping Triple-A will get you career earnings of roughly $47 million. Wilmer Flores – He fouled a ball off his face, and he lived to tell about it. Sean Gilmartin – With his going from the Mets to the Cardinals, he was able to prove he wasn’t bad. It was just the Mets as an organization did not employ anyone capable of knowing he was actually injured. Curtis Granderson – He had a front row seat to seeing Chase Utley fail in the postseason. Robert Gsellman – He has so much self confidence he doesn’t care what anyone things of him. Matt Harvey – Between the Tommy John, TOS, and the Mets rushing him into the rotation with atrophied muscles in his throwing arm knowing he wouldn’t really be ready until a month into the season, he should be thankful for getting out of the season with his right arm still attached. Ty Kelly – He got out of here after one game thereby preventing Nurse Ratched from getting to him and ending his season. Juan Lagares – With all the injuries and the Mets looking to cut payroll, he is once again the center fielder of the future. Seth Lugo – As we learned in the WBC and regular season, when he’s blonde, he’s Cy Young the first two times through the order. Steven Matz – With him suffering the same injury deGrom suffered last year, we all know he can come back from this to be the same exact injury prone pitcher he was before the surgery. Kevin McGowan – He will always have a special place in Mets fans hearts as it was his call-up that forced Ramirez off the roster. Tommy Milone – He was able to find a team that was okay with him having an ERA over 8.00. Rafael Montero – For the first time in his life, he wasn’t a complete abomination as a pitcher. Tomas Nido – Even with his struggles at the plate in Binghamton, he can rest easy knowing the Mets don’t expect an OBP over .300 from their catchers. Brandon Nimmo – No one, not matter what, has been able to wipe that smile off of his face. Tyler Pill – In a year of embarrassing pitching performances by Mets pitchers, Pill actually acquitted himself quite well before suffering his season ending injury. Kevin Plawecki – He’s so well liked by his teammates that someone left him a present in his locker, which apparently has inspired him to hit the ball harder and longer thereby resurrecting his career. Neil Ramirez – Somehow, someway, he was not the absolute worst pitcher on a team’s pitching staff. AJ Ramos – To him, getting traded to the Mets meant he was traded to a team that actually spends money in the offseason. Addison Reed – He was so good this year he was worth not just one but three right-handed relievers. Jose Reyes – The Mets didn’t cut him or his playing time no matter how horrible he played during the 2017 season. Matt Reynolds – He got that long look in September Sandy Alderson promised him. Unfortunately, that only amounted to him getting 10 games to show what he could do at the MLB level. Jacob Rhame – He’s with an organization that has had success getting flame throwing right-handed pitchers who have slimmed down since getting drafted reach their full potential. Rene Rivera – After failing to whisper loud enough to help the Mets pitchers pitch better, he was able to go to the Cubs to help their pitchers lead them to an NLCS berth. T.J. Rivera – With Warthen and Ramirez gone, he’s not going to have to worry about anyone mishandling his return from Tommy John. Hansel Robles – In his mind every ball hit in the air is an inning ending pop up. Amed Rosario – He didn’t have to have his development hampered by being expected to be the savior when he was called-up to the majors as the Mets were well out of contention on August 1st. Fernando Salas – Despite his rough stint with the Mets, he was able to land with the Angels to end the season thereby proving it was the Mets handling of pitchers and not him that was terrible. Paul Sewald – As a reward for all of his hard work in Vegas, he got the privilege of being the arm Collins loved to abuse during the season. Josh Smoker – After the Mets finally gave up on using a pitcher with a history of shoulder issues as the long man in the pen, he showed the team in September that he could be as a lefty out of the pen to get lefties out. Noah Syndergaard – Mr. Met flipped off someone this year other than him. Travis Taijeron – With the Dodgers just signing him to a minor league deal, he is now all but assured of becoming the next Justin Turner. Neil Walker – The Mets moved him to the Brewers where he was able to re-establish his free agency value by being productive and by staying healthy, which was coincidentally was when he was away from the Mets medical team. Adam Wilk – Because Harvey was at home one day in his pajamas, he set off on a path where he would become eligible to earn a share of the postseason money awarded to the Twins for claiming the second Wild Card. Zack Wheeler – Instead of missing two years due to injury, he missed two months. David Wright – Despite all evidence to the contrary, the Mets still have not given up on him. Terry Collins – At the end of the day, he was able to make a friend of Fred Wilpon who had his back no matter what. We should all be so lucky. Dan Warthen – He found a new group of pitchers in Texas who have elbows waiting to learn how to throw that Warthen Slider. Kevin Long – After departing the Mets, he was able to smuggle the page out of his binders that showed exactly how he turned Daniel Murphy into Babe Ruth. He can now bring that with him to Washington. Sandy Alderson – Collins was so poor at managing, he was able to convince ownership it was all Collins’ fault and not his for poorly constructing a roster. Mets Fans – Well, even if it wasn’t at this post, we all still have a sense of humor, and we can still laugh at what we put up with from this team on a daily basis. This was a Mets game that went from promising to false hope, to utter surprise, to more often same, to sheer shock, and finally joy. The homer must’ve been extra special as he was back in his hometown in front of his friends and family. The Mets lead grew to 4-0 when Wilmer Flores hit a third inning sacrifice fly scoring Asdrubal Cabrera. Cabrera found himself on third because while advancing to second on a Ariel Miranda wild pitch, catcher Mike Zunino hit him with the throw. With no one guarding third, Cabrera was able to get there without a play. For an ever so brief moment, this seemed like enough for Rafael Montero, who started the game terribly. Through the first four innings, Montero had allowed just one hit – a homer by Zunino. It all came crashing down for him in the fifth. There were some reasons why. Montero was facing the Mariners the third time through the order. He was getting squeezed a tad by the home plate umpire. As Keith Hernandez pointed out, Rene Rivera was not calling a good game. No matter what the reason, the biggest issue was Montero stopper executing. Montero loaded the bases with no outs, and he threw a wild pitch allowing a run to score. It was definitely a wild pitch, but it’s also true Rivera didn’t get down completely to block that pitch. Montero then walked Jean Segura to re-load the bases, and Robinson Cano hit a sacrifice fly to pull the Mariners within one. Montero then issued another walk, this one to Nelson Cruz, to re-load the bases. At this point, Terry Collins did what he had to do, and he pulled Montero. Unfortunately, Josh Edgin didn’t get the job done. He allowed a two run RBI single to Kyle Seager. With that, the Mets 4-1 lead became a 5-4 deficit. Through the work of Hansel Robles and Jerry Blevins, the Mets remained within a run. The Mets got that run back when Conforto hit not just his second homer of the game, but his second homer of the game against a lefty. This time it was Marc Rzepczynski. This led to the Mariners bringing in a friendly face – David Phelps. Entering the game, Phelps had a career 6.09 ERA against the Mets. The ERA would go up. Cabrera and Bruce each singled, and Flores hit what could’ve been a double play ball due to his lack of speed. With Flores just barely beating the throw, the inning continued. Neil Walker would go the other way with the ball hitting an opposite field RBI single against the shift. Flores would then score on a Curtis Granderson RBI single off the glove of Mariners first baseman Danny Valencia. The single gave the Mets a 7-5 lead. Like we’ve seen with Paul Sewald on a few occasions this year, he got himself into some trouble. With the Mets having used both LOOGYs, Collins stuck with his young reliever in this spot. After a Jarrod Dyson sacrifice bunt, the Mariners had runners at second and third with one out. Sewald escaped the jam striking out Zunino and getting Segura to strike out. This set the stage for what may very well be Addison Reed‘s last save opportunity as a Met. With a Ben Gamel grounder eating up Walker, it appeared as if this could be another tense outing. Reed settled down, and he erased Gamel inducing Robinson Cano to hit into a 4-6-3 double play. After a Nelson Cruz fly out, Reed had his 19th save of the year. It was a good win. At a minimum, it shows even with the Mets selling this team is still playing hard. The problem with Zack Wheeler is we don’t know why he is struggling so mightily. Is it because he hadn’t pitched in over two years due to his Tommy John surgery? Is it because there is some injury he and/or the Mets are hiding? Is this just him being the same pitcher he has always been in his career? The right-hander has not won a game since May 20th losing his last five decisions. He has not pitched past the sixth inning since June 7th. No matter what you want to look at, he just hasn’t been good. Tonight would be no exception. On the second pitch of the game, Matthew Joyce would hit a homer to give the Athletics a 1-0 lead. When Wheeler then walked Marcus Semien, you knew it was going to be a rough night for Wheeler. In that poor first 36 pitch first inning, Wheeler allowed four runs on three hits and four walks. He allowed the aforementioned homer and a double to Bruce Maxwell. He put his team well behind the eight ball, and he put them further behind as he grooved a 92 MPH fastball over the heart of the plate to Matt Chapman, who hit a long home run. Not to belabor the point, but if Wheeler is throwing 92 MPH fastballs, something is wrong here. Something’s really wrong when you’re walking an American League pitcher. With this diminished stuff and his continued control issues, he didn’t give the Mets much of a chance. His final line was five innings, seven hits, five runs, five earned, four walks, and six strikeouts. He needed 1oo pitches to just get through the fifth. The Mets looked dead in the water, but fortunately for once their bullpen kept them in the game. The Mets would get a scoreless inning from Josh Smoker and two scoreless from Josh Edgin. It didn’t look like this work would matter much as A’s starter Sean Manaea was straight dealing. Unlike the old adage, the homer did not kill the rally. Jose Reyes tripled, and Travis d’Arnaud brought him home with an RBI single. Curtis Granderson then came into the game as a pinch hitter. Granderson hit a grounder that would normally have been an inning ending double play. Because the A’s had the shift on, it gave Granderson an opportunity to beat the throw to first. That would allow d’Arnaud to score the third run of the inning, and it would give Michael Conforto an RBI opportunity. Since Conforto was called-up to the majors, he was given little chance to prove he could hit left-handed pitching. For some reason, he was benched against them until it almost became a self fulfilling prophecy. However, with all the injuries, the Mets have not had the same ability to bench him against lefties. During this season, Conforto has proven those previous decisions to be just plain silly, and he did it again tonight. On the night, Conforto would go 2-5 with a double and one RBI. That double and RBI came in this sixth inning at-bat when he hit an opposite field double scoring Granderson from first pulling the Mets to within 5-4. The Mets would then get a chance in the eighth. After a T.J. Rivera lead-off single, it looked as if the Mets had things cooking with Reyes at the plate. Reyes has been hitting well of late, and he was great in tonight’s game. Overall, he was 2-4 with two triples and a run. This at-bat was not one of those two triples as he hit into a double play. d’Arnaud, who was having a great game of his own going 3-3 on the night, got the two out double over the head of A’s center fielder Rajai Davis. The Mets then announced Lucas Duda as a pinch hitter, and the A’s countered with the left-hander Daniel Coulombe. Duda stayed in on the pitch, and he hit a single up the middle easily scoring d’Arnaud and tying the game. The last time Flores hit a walkoff homer, it helped propel the Mets into the National League East title. This homer the Mets have a four game winning streak, but it may still be too little too late. Still, that does not mean we should enjoy this 6-5 win any less. Game Notes: With the trade rumors swirling, Asdrubal Cabrera started the game at third base. This was Robles’ second win in as many days. When all hope is lost, the main reason to watch the Mets is Jacob deGrom. He started today, and he delivered. While deGrom may not have been as dominant as he has been over this stretch, he was still great. For the first six innings, no Cardinal player reached third base. In fact, the Cardinals only reached second base twice in the game. deGrom’s final line was 6.2 innings, seven hits, one run, one earned, one walk, and three strikeouts. That one run shouldn’t have scored. 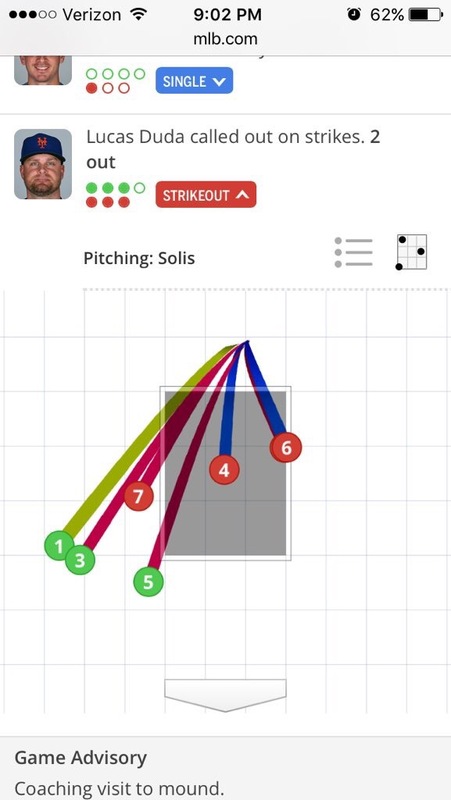 Luke Voit had a hard hit ball to the wall Yoenis Cespedes fielded cleanly, and he had Voit dead to rights at second. Only issue is Asdrubal Cabrera didn’t bother to cover second. Instead a run scored, deGrom got his ovation, and Paul Sewald got the Mets out of the inning. With deGrom going like this, you knew the Mets needed one, maybe two runs to win the game. Mets took care of that and then some. This should come as no surprise as the Mets have now averaged 7.4 runs per game over deGrom’s now seven game winning streak. In the first, the Mets put three runs on the board and all were with three outs. A Cespedes single scored Cabrera. Lucas Duda doubled home Cespedes, and Wilmer Flores brought him home with an RBI single. Flores getting the start was interesting, especially with the right-handed Mike Leake getting the start for the Cardinals. Perhaps it was due to T.J. Rivera making two errors yesterday. Maybe Terry Collins just wanted to give Flores a game after he’s sat for so long. Maybe it’s due to the tumors the Red Sox may have interest in him. After the good first inning, the Mets had a better second inning. Michael Conforto got things started with a single, and he moved to third on a Jedd Gyorko error allowing Cabrera to reach. Jay Bruce hit an RBI single, and Cespedes followed with an RBI double making it 6-0. After Duda was intentionally walked Jose Reyes singled home Cespedes to make it a 7-0 game. It should’ve been a laugher. It wasn’t. In the eighth, Sewald was pulled by Collins with two on, two out, and back-to-back lefties due up for the Cardinals. Rather than find something out about Sewald in a 7-1 game and rest his bullpen with a noon game tomorrow, Collins couldn’t help himself. He went to a completely worn down Jerry Blevins. While Blevins has been great most of the year, he has struggled mightily since June 1st. In that time, Blevins has a 5.84 ERA and batters are hitting .269/.367/.423 off of him. Left-handed batters Kolten Wong and Magneuris Sierra hit consecutive singles to make it 7-3. With those two singles, Blevins has now allowed 25 inherited runners to score this year, which is the fifth worst in the majors. After Blevins walked the pinch hitter, pitcher Adam Wainwright, to load the bases, Collins had to go to Addison Reed for the four out save. As Reed is really the only remaining reliever who is reliable left in that bullpen, it should be no surprise Reed made quick work of the Cardinals for his 16th save of the season. With the 7-6 win, the Mets have an opportunity for the split tomorrow. Game Notes: Josh Edgin has allowed more inherited runners to score than Blevins with 29. That’s the third worst mark in the majors. Despite all of the Mets problems coming to surface in this game, they still had a chance to win this game. Like most of his career, Zack Wheeler was cruising until he suddenly lost the strike zone. He kept dodging trouble when the game was scoreless, but once he got a 1-0 lead courtesy of a Michael Conforto homer, he and the Mets pitching fell apart in the sixth inning. New Mets killer Paul DeJong hit a two run homer giving the Cardinals a 2-1 lead. The rally continued with Cardinals starter Adam Wainwright hit an RBI double giving the Cardinals a 3-1 lead. Jose Reyes followed with a Little League homer as Magnerius Sierra first booted the Reyes double and then threw it away. The rally ended with Cardinals pitcher Tyler Lyons somehow grabbing a Conforto liner up the middle. Even with the frustrating play, the Mets had a chance to tie things in the ninth. Curtis Granderson worked out a leadoff pinch hit walk against Cardinals lefty Kevin Siegrist. Mike Matheny responded by going to Brett Cecil. This is the same Cecil who just blew a save yesterday. He started out shaky giving up a one out single to Asdrubal Cabrera. This brought up Cespedes as the tying run. Cecil would go to 3-0 to Cespedes, and the unthinkable happened. Whereas Cespedes swung and grounded into the game ending 6-4-3 double. Game over. There was much criticism of Cespedes swinging there. It was largely unfounded and based on the result. Cespedes could’ve tied the game on one swing. Based upon what we saw in 2015, we all saw how he can be a game changer. But this isn’t Cespedes of 2015. This is a 31 year old outfielder is a shell of himself with all the leg injuries. With all that said, of course he grounded into the game ending double play. A day after failing to sweep the Cubs, the Mets blew a chance to beat the Cardinals. If the Mets really want to go on that second half run like they’ve done the past two years, the run needs to begin now. It needs to begin now because the Mets have put themselves in a deep enough hole. It needs to happen now because the Rockies are in town. For the Mets to get on that run, their pitching needs to be great, and Yoenis Cespedes needs to get going. Tonight, that happened. Jacob deGrom shook off an unearned first inning run to completely dominate the Rockies. Over eight innings, he only allowed four hits, two runs, one earned, and one walk with 10 strikeouts. The Rockies had an opportunity to score a third run in the sixth, but Cespedes nailed DJ LeMahieu at home plate. It was a typically strong throw from Cespedes, and it was a great tag by Travis d’Arnaud. The lesson as always is you do not run on the tandem of Cespedes and TdA. In addition to this throw, Cespedes was great at the plate once again going 4-6 with a run, double, and an RBI. Two of Cespedes’ hits came in a six run third inning where the Mets knocked Rockies starter Jon Gray out of the game, and they blew the game open. Cespedes got the inning started with a double. Both he and Jay Bruce would score on a T.J. Rivera RBI double. Rivera would come around to score on a Jose Reyes single. The Mets would keep the rallying going loading the bases with no outs. After a deGrom strikeout, Mets All Star Michael Conforto knocked in a run with an RBI groundout. An Asdrubal Cabrera RBI single later, and the Mets were up 8-2. Rockies reliever Scott Oberg loaded the bases in the eighth, and he walked Cabrera to bring home the 13th run. Cespedes followed with an RBI infield single to cap off the Mets scoring on the night. Jacob deGrom has a league leading 12 hits as a pitcher, second most is three guys with 8. This is the type of onslaught where you can at least dream of the Mets making a run. Certainly, there’s an opportunity ahead of the trade deadline. There’s an opportunity when the Mets playing up to their abilities like they did in tonight’s 14-2 victory. Game Notes: This was deGrom’s seventh double digit strikeout game and 17th of his career. Nolan Arenado seemed to injure his hip running through the bag at first base, but initially stayed in the hand. Later, he was pulled. It was unknown if an issue flared or if it was due to the blowout. Josh Edgin pitched a scoreless ninth. The problem with pitchers’ duels in the modern game is that eventually end due to pitch count and managerial decision. We’ll never again see Juan Marichal and Warren Spahn dueling for 16 innings. Instead, we eventually get a battle of the bullpens. That battle makes both Mets fans and Nationals fans uneasy because both teams have terrible bullpens. Steven Matz and Stephen Strasburg were both terrific matching zeros through seven innings. Matz allowed for hits while walking two while striking out four. Strasburg gave up two hits while walking three and striking out six. The relievers that followed were nowhere near as good. Accordingly, Dusty Baker and Terry Collins were mixing and matching and failing. The Mets got the first crack at the bullpen in the eighth, and they are going to want this inning back. Nimmo was out by a pretty good margin. Maybe a better slide, and Nimmo is safe. Possibly, Asdrubal Cabrera being in position to direct Nimmo could’ve made a difference. A different replay official, and the call reasonably could’ve been overturned. Instead, the call stood. The send was bad on so many levels. Most importantly, there was only one out, and the middle of the lineup was coming up against a terrible Nationals bullpen. Cabrera would walk, and the Mets would send Yoenis Cespedes to the plate. He would come up short in a big spot. It wouldn’t be the last time. The Nationals wouldn’t waste their chance. Ryan Raburn hit a pinch hit single, and Michael Taylor followed with a two run homer giving the Nationals a 2-0 lead. But the game wasn’t over because the Nationals bullpen is terrible too. This is when critical decisions are made. Addison Reed was warming up, but with the game tied, Collins wasn’t going to bring in his closer on the road unless it was a save situation. This was the Buck Showalter–Zach Britton decision all over again, and Collins showed he learned nothing. He initially stuck with Paul Sewald, who bailed the Mets out if the eighth. Sewald walked Matt Wieters to start the inning, but he struck Wilmer Difo out, who was trying to get the bunt down. At that point, the Mets had a sinker baller on the mound and needed a double play to get out of the inning. Collins would’ve stick with Sewald, nor would he go to Reed in the spot. Instead, he went to Josh Edgin when Stephen Drew was announced as a pinch hitter. Edgin walked Drew pushing the winning run into scoring position. Adam Lind flied out setting up first and second with two outs, and Ryan Raburn coming to the plate. Still, Collins would not go to Reed. No, he went to Fernando Salas and his 6.31 ERA. Raburn hit a ball to left field that dropped in front of a sliding Yoenis Cespedes. To add insult to injury, Cespedes pulled up lame on the play, and he won’t be playing tomorrow. Bad managing and a bad bullpen led to a loss. It’s been all too redundant this year. Game Notes: Daniel Murphy grounded out in a pinch hitting appearance in the eighth marking the first time in 30 games against the Mets he did not reach base. Heading into the season, it was an either/or decision between Jay Bruce and Curtis Granderson. Not getting what they wanted on the trade market, the Mets instead opted to keep both. With a Yoenis Cespedes DL stint and Michael Conforto getting nicked up, the Mets are sure glad it turned out that way. Today was another example why. Granderson would once again lead off the game by getting on base. This time it was a lead-off double against Marlins starter Jose Urena. He then came home to score on a two out Bruce RBI double. Bruce then scored on a T.J. Rivera RBI double giving the Mets a 2-0 first inning lead. Bruce wasn’t done doubling Granderson in. In the third, Granderson started another rally. This time he reached in what should have been ruled an infield single. It was a really tough error on JT Riddle. Cespedes followed with a one out infield single of his own before Bruce doubled in Granderson. Again, TJ followed a Bruce RBI with one of his own. This time it was an RBI single bringing home Cespedes. Bruce scored on a Jose Reyes sacrifice fly giving Seth Lugo a 5-0 lead. Lugo shook that off and got the Mets into the sixth inning with a 5-1 lead. The Marlins would then rally and make a game of it. He had none on and two outs after Dee Gordon was gunned down by Rene Rivera. That’s when Stanton got a rally started for the Marlins. He and Christian Yelich hit back-to-back singles bringing Martin Prado to the plate. He singled to left, and for a moment it appeared Cespedes gunned down Rivera. However, the non-sliding Stanton knocked the ball loose scoring the run and allowing Yelich to get to third. With Justin Bour at the plate, a perhaps shaken up Rivera tried to backhand a pitch in the dirt. As the ball scooted away, Yelich scored to bring the Marlins within 5-3. After getting Bour out, the book was closed on Lugo. His final line was six innings, six hits, three runs, two earned, one walk, and four strikeouts. Unlike most games, the Mets would get an insurance run. Matt Reynolds busted it out of the box, and he tripled to right off of Marlins reliever Nick Wittgren. Jarlin Garcia entered the game with Brandon Nimmo announced as a pinch hitter and Granderson behind him. Terry Collins opted to pinch hit Wilmer Flores for Nimmo. Flores couldn’t bring home Reynolds leaving it to Granderson. Granderson delivered with an RBI groundout giving the Mets a 6-3 lead. In the eighth, there were two double plays that kept the game tied. In the top half, in one motion, Riddle caught a Reyes line drive and beat Bruce back to second base. In the bottom half, Josh Edgin was in a precarious spot after a Gordon lead-off single. He struck out Stanton, and he got Yelich to ground into the inning ending 4-6-3 double play. After a scoreless ninth, Addison Reed recorded his 12th save giving the Mets the series win over the Marlins. Believe it or not, after a disastrous start to the road trip in Los Angeles, the Mets had a .500 road trip. Game Notes: Lucas Duda sat a second straight game with the flu. He made once pinch hitting appearance striking out. Tonight’s game effectively started like yesterday’s game. Corey Seager and Cody Bellinger each hit a two run homer to give the Dodgers a 4-0 lead over the Mets. From there, Robert Gsellman allowed solo shots to Seager in the fourth and Yasmani Grandal in the fifth giving the Dodgers consecutive four home run games. Another run scored off a Joc Pederson RBI double. That capped off three straight Dodger extra base hits. It also was the end for Gsellman. Gsellman’s final line was 4.2 innings, nine hits, eight runs, seven earned, three walks, and two strikeouts. At this point, it’s safe to assume he’s taking the loss. For his part, Jose Reyes should take a lot of blame with his killing two rallies off Dodger starter Brandon McCarthy. He ended a third inning rally grounding into a double play. In the fifth, he struck out with runners on first and second. His counter-part wasn’t missing. Seager homered off Josh Edgin in the fifth giving him three homers in the game. At that point, it was 10-0, and the game was effectively over. [If more happens worthy of mentioning, this will be updated]. This season has completely unraveled. It’s time to sell for whatever they can get . . . no matter how little the return. Game Notes: Gavin Cecchini was rewarded for yesterday’s homer by being put in the lineup and batting eighth behind Rene Rivera. So far, he’s 1-2. The unearned run was the result of a T.J. Rivera throwing error allowing Justin Turner to get on in front of the Bellinger home run.